OceanWise’s Will Girard wins at the 2018 Apprentice of the Year Awards! OceanWise > News > Uncategorised > OceanWise’s Will Girard wins at the 2018 Apprentice of the Year Awards! 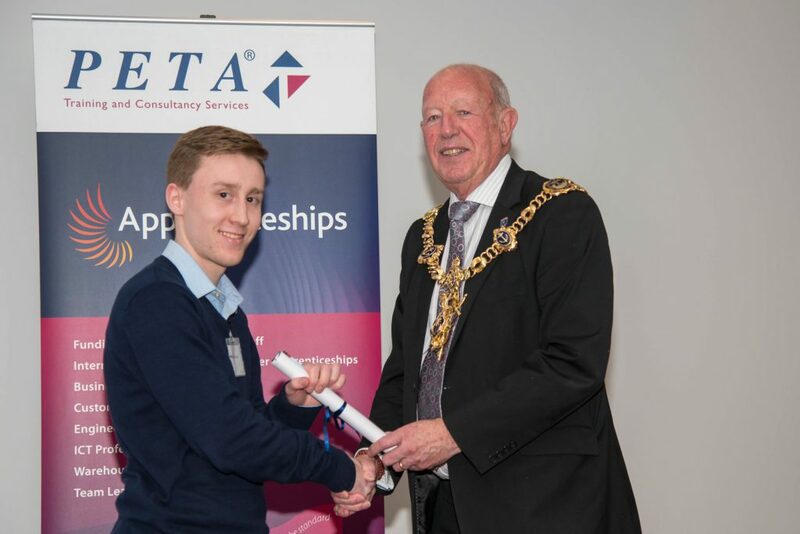 OceanWise’s Will Girard, who started with the team in September 2016, has won an award in recognition of his high standards of achievement, outstanding commitment and excellent progression at the recent PETA Apprentice of the Year Awards 2018. Will is pictured below receiving his award from the Lord Mayor of Portsmouth. Will joined OceanWise as Business Administration Apprentice, seeking to gain a qualification whilst working, and has gone from strength to strength becoming an integral part of the team. “OceanWise is dedicated to supporting the apprentice scheme as we believe that not only does it bring emerging talent into the business, it also offers young people the chance to develop their skills and progress quickly whilst gaining qualifications. We couldn’t be prouder of Will and what he has achieved during his time here.” Dr. Mike Osborne, Managing Director OceanWise.